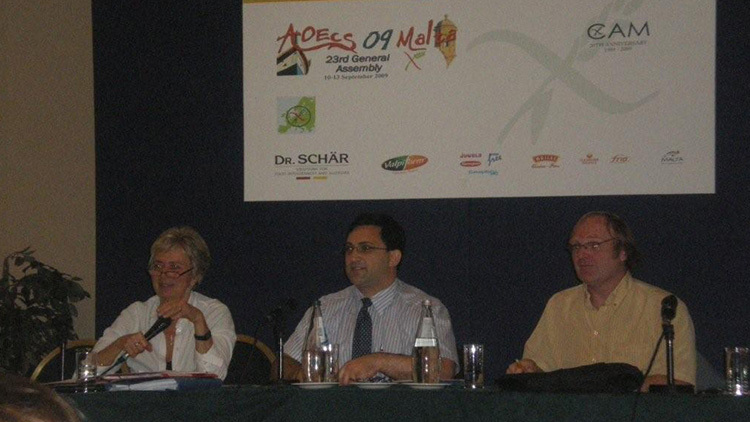 The 23rd AOECS Conference was held in Malta at the Inter Continental Hotel St. Julians from the 10th to 13th September 2009. 76 delegates including 20 youths, representing 24 member countries attended. In conjunction with the AOECS Conference a CD-Medics Training Seminar was also held. Various speakers gave very interesting presentations both during the seminar and during the AOECS sessions. Reports of the different working groups were also presented. The following are some interesting points noted during one of the talks. 75% – 90% of Coeliac Disease is missed. Genetic disposition + exposure to Wheat, Barley, Rhy = Coeliac Disease. Out of 30% that carry the gene only 1% develop Coeliac Disease. Higher number of siblings with Coeliac Disease increases the risk. Breast feeding reduces the risk of Coeliac Disease. Prevalence of Coeliac Disease is much higher than cases diagnosed by means of symptoms. First degree relatives first tested should be tested again within 2/3 years. During the conference two very important decisions were taken. The finalisation and agreement on the adoption of the regulations on the use of the cross grain symbol on food products within Europe to provide unified licensing conditions. The symbol is a clear identification of food products which comply with the AOECS Standard determining the thresholds, analytical method and frequency of analytical testing. To increase the AOECS board members from 3 to 5 persons in view of the constantly increasing work load of board members. The Coeliac Youth of Europe (CYE) group also held their General Assembly. Manuel Azzopardi, Martha Carabott & Daniela Attard represented Malta. The youths’ vision is to improve life conditions for young Coeliacs. Their project for 2009-2010 was to inform youngsters about the possibilities of gluten free life abroad and inform sources of further information thus encouraging young coeliacs to go abroad and live there for a longer time despite being coeliacs. Towards the end of the conference session the Exhibition Hall was open to members of Coeliac Association Malta where they had the opportunity to visit the stands put up by the various gluten free suppliers and view and sample the extensive range of gluten free products exhibited.